1 Why are BOSU balls so popular? 2 Do BOSU Balls work? 3 Should you by one? 4 Best buy options for the BOSU ball, and our favorite colours! Invented in 1999 as an alternative to a standard exercise ball, the BOSU (short for Both Sides Up) the Bosu Balance Trainer reviewed here has become a standard piece of equipment for gyms across the country. Basically its a swiss ball that has been cut in half and mounted on a plastic base. It can be used for dozens of exercises, training core strength or improving balance. However they seem to get a bad press in the fitness industry. Like anything popular its going to get a bad rap somewhere. On the quest to keep workouts new and interesting for clients Physical Trainers have been bringing out the BOSU for more extreme and bizarre exercises. Why are BOSU balls so popular? Because they work, and are easy to use BOSU’s have become the go to item for gyms, also unlike a Swiss Ball they are unlikely to roll away across the gym. BOSU balls are very flexible for workouts, used for press-ups, planks and weight training exercises, the only thing limiting your use of the BOSU is your own imagination. There have been some studies carried out into the effectiveness of various BOSU workouts. These are limited and produced no real conclusion. What they did discover is that for strength training no additional muscles are activated. The studies did not look at the effect of body conditioning from the core training, or improved balance which is also part of the BOSU offer. We would say that anything that makes your workout more interesting and fun is great! Adding a BOSU ball to an exercise like push-ups or plank, by resting your feet on it really adds an extra dimension, and increases the difficulty considerably. What types of BOSU balls are there? There are technically two BOSU balls, the Home version and the Commercial one. I cannot see major difference in the actual products the pro just has a slightly thicker base, however the home version ships with a DVD and foot pump. The Pro just comes with the ball! With the PRO coming with less kit and a higher price tag we would recommend sticking with the Home Version. They are quite bulky even when deflated. We would suggest buying on line where the price can be about $110 for the home version. Amazon seems to have the best price currently. Any issues with the BOSU Ball? It’s not uncommon for the air to leak out of the ball. This is not usually a fault with the BOSU, its just that its been over inflated. To fix this simply undo the screws on the base, re set the rim of the ball on the plastic base (its like a bike tyre) tighten everything back up and re-inflate. If you are finding your exercise at home a little repetitive or getting too easy then these are a great way of pushing yourself. Other great uses for them are if you have to sit for any time, use the BOSU, it will keep your core engaged and is great for your posture. They are not easy to transport, so once you have yours home you probably don’t want to haul it to the gym and back. Find a place for it in your home and the BOSU Balance Trainer Ball will serve you well for years. Best buy options for the BOSU ball, and our favorite colours! Focus on a full body workout or mix and match core, upper body and lower body to create endless workout options. 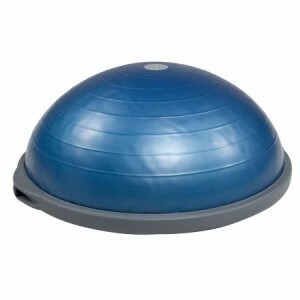 Use the Bosu Balance Trainer dome side up or down to create different exercise options. 90 Day Warranty. Maximum user weight: 300 lbs.